Currently, egg-white Lysozyme is allowed for the manufacture of cheese and wine as an anti-microbial stabilizer/additive in EU, USA, China and Japan, but residual amounts of egg-white lysozyme is considered sufficient to trigger allergic reactions in susceptible individuals. How to discover dosage-less and allergen-free of new source lysozyme are a big challenge. The new generation of Lyosch® G4 takes Lysozyme to the new height against both Gram-positive and Gram-negative bacteria, only 2-5ppm can lyse the bacteria without allergen risk. Lysoch® G4 Lysozyme is antimicrobial enzyme produced by food cultures, and is mainly used to lyse both Gram-positive and Gram-negative bacteria during the process production of processed foods. In general, to deploy Lysoch® G4 dipping solution with cold boiled water or distilled water, then add direction into foods. 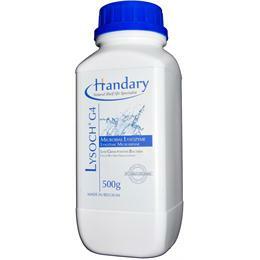 Lysoch® G4 is available in 500 gr/bottle with integral, tamper-proof seals. Packaging is available in other quantities. Genetically modified organisms /200mg (PCR method). 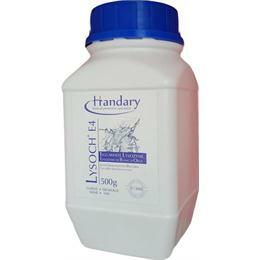 Lysoch® G4 vary considerably in the countries in which it is currently approved. Advice regarding the legal status of this product is available on request. In general, to deploy Lysoch® G4 dipping solution with milk or wine, then add direction into foods.